Personality: Oasin is a very paranoid being. 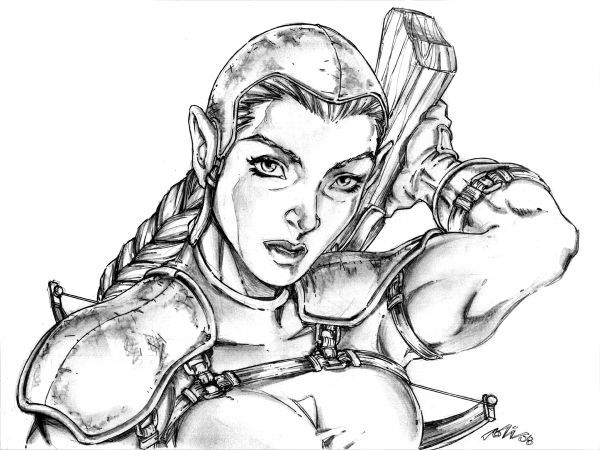 After being left to fend for herself or die (hope fully to die) by her parents an elf noble and a human fighter, she had a hard time trusting love and concern from others. She is often found alone for seems to be an introvert but when around friends or enemies alike she is alarmingly, almost too nice of a person. Many are often suspicious of her pranks but not many realize that they are meant to be an inside joke between her and her mentor Ur. Appearance: Oasin has red wavy hair that runs to the small of her back. She often wears it in a braid and pulls it over her right shoulder. Her cheeks and nose are often sun burned and peeling while she has quite fair skin. Her eyes are an auburn hue with specks of gold. She wears hide armor over a cotton gauze blouse and pants. Her belt and fanny pack carry her small possessions. Her battle axe is strapped to her back. Her blow gun is hidden within her knee high leather and fur boots. Her star knife is strapped to her arm under her sleeve. Many remedies and healing plants are hanging from her belt. Class and Profession: Oasin chose to become a ranger because she had already knowledge of the nature and wilderness plus had a special connection to most creatures. She also didn’t want to “waste” her time learning a new lesson when she was already superior to most as a ranger. She enjoys doing things over and over and getting better each time. Relationship with Ur: when Oasin was 12 an Oriad monk named Ur found her when she tried to pry a gem from his back. He brought her to his temple and tried to tame her savage ways but only partly succeeded. She still has horrid manners but she knows how to be civilized when not eating. Charter: Oasin was given a charter of Brevoy because of her knowledge of plants and uncharted land masses. She knew how to survive better than most chosen for the adventure. Mystery: Oasin was once approached by a special horse, a kelpie. The kelpie is mostly dangerous to humanoids because they either try to eat then or drown them in a pool of water. Now hunted for their teeth. These teeth make indestructible arrow heads. Oasin was approached by one of these rare creatures and was nurtured by it for several days until it mysteriously disappeared. Over her life time Oasin has suddenly seen a black wet horse but only to see it turn into a pool of water. Oasin believes it is an omen of troubled times ahead. Downtime: in her down time Oasin either takes hikes or creates remedies to sell to local wizards. Occasionally Oasin spends time playing GO with Ur, and hoping some day to beat him. Family: Oasin’s “family” is Ur, an Oriad monk, ethno, a local dwarf ranger she often runs into who has been her ranger master as she is his apprentice, and the mysterious kelpie. Side notes: Oasin is often the last to enter a fight because she likes to observe and plan before she creates a surprise attack or distraction. She likes to know or at least be as prepared as possible.